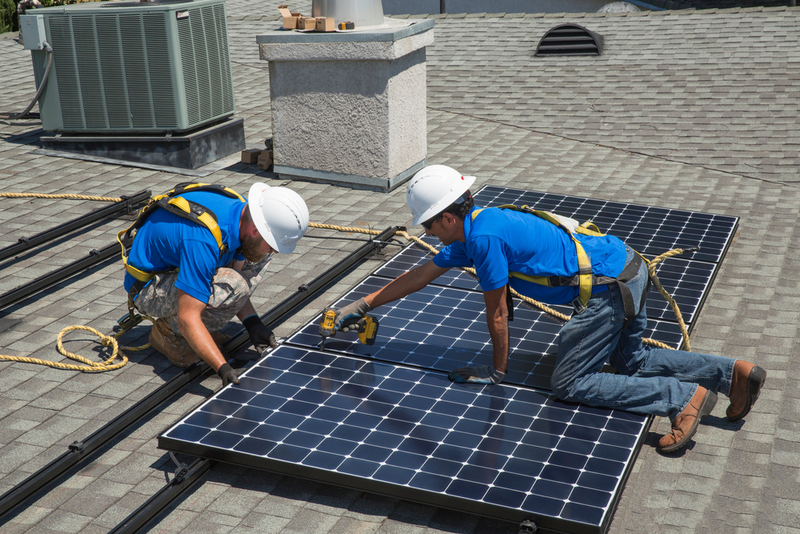 Solar is a growing industry that’s offering new job opportunities. In 2016, the U.S. solar industry employed 260,077 people, 9 percent of which were veterans of the U.S. Armed Forces. That makes sense, since active and transitioning military personnel have access to the Solar Ready Vets® program, which provides solar training and employment opportunities for veterans. In recognition of Veterans Day 2017, SunPower sat down for a Q&A with veteran Brian Miholland, 51, owner of Milholland Solar & Electric, in San Diego, Calif., and discussed everything from repairing military craft such as COBRAs and Hueys to installing solar at a local VFW post. Read Milholland’s story below to get an inside view of solar jobs for veterans. Q. What part of the military did you serve in? A. I was in the 82nd Airborne, Combat Aviation Brigade of the U.S. Army, based in Fort Bragg, North Carolina. Q. Why did you enlist? A. I come from a military family. My grandfather was in the Army and then the Air Force. He served during World War II, Korea and Vietnam. My stepfather is retired Navy, and I have an uncle who is retired Air Force. Growing up in Southern California, there is a large Navy and Air Force presence, so I like to joke and say that I rebelled by joining the Army. Q. When did you start Milholland? A. I was in the Army for three years, and I started Milholland Electric two years later. I did electrical repair on helicopters, mostly COBRAs and Hueys. I took some residential and commercial wiring classes on base and leveraged that training to get my Electrical Contractor’s License in December of 1989. This year, we celebrated 28 years in business. Q. What kind of projects do you specialize in? A. We do a lot of residential rooftop solar projects, but we also do ground-mount and small and mid-size commercial projects. We just signed a contract for our first carport on a non-profit, St. Madeline’s Sophie’s Center. It’s a learning center that helps adults with developmental disabilities. We have a special project in Imperial County with Citizens Energy Corporation, where we install solar for lower income families at no charge. We’ve been doing it for four years and have installed 450 solar projects. Q. What do you like about working in solar? A. I like helping people reach their energy independence goals. I see people so frustrated with not being able to control their utility bill. I hear of couples fighting about where the temperature is set. It feels good to be able to give people an option. Every customer is unique, so every day we have new solutions to come up with. I’ve always been on the cutting edge of technology, ever since I was an electrician, and my goal is to bring those new innovations to my customers. Q. Did your military career prepare you for working in solar? A. Absolutely, the training to be an aircraft electrician definitely prepared me to work in solar. The components in helicopters and solar are all basically the same. We have AC/DC currents, batteries and inverters in an aircraft. When I started my solar training, all my military training just came flooding back. Being in the military has also helped me train my crews and staff and has given me leadership skills. One thing I took directly from my commander is making the effort to go around and talk to all of the people (25 employees) that work at Milholland. I treat the company a bit like a (military) unit; we solve problems together, and we empower people to make decisions. Everyone should be able to do their jobs up and down, so you can step in and take over, or so that we can all pitch in and help as needed. We don’t have a militant atmosphere in the office, though. We try to keep it light. Q. Do you employ fellow veterans? A. Yes, we do. We have veterans on our sales team, in the office and on our installation crews. I obviously look for veterans in our pool of candidates because I know the training they’ve been through. Once you’ve been through four to six years in the military, other things just come a bit easier. Q. Any advice for vets considering a career in solar? A. There are programs on base and at junior colleges that provide education to prepare transitioning military members for careers in solar. If you’re interested, you should talk to your VA and see what programs are available for you. Q. Do you ever install solar for vets? A. Yes, all the time. In honor of National Veterans Month, Milholland Electric is donating a solar electric system to support the Black Contractor Association YouthBuild, who are engaging in the renovation and rehab of a low-income affordable home for a veteran. San Diego also has a large military community, and we tend to attract those customers. It’s funny, but I installed a rooftop system on a former Naval officer’s home as one of my first projects. Years later, he reached out and had us install a solar system on the local VFW post he led. We’ve since installed solar on that VFW and others in the surrounding communities. Q. How did it feel to be named California’s 2015 business of the year? A. That was a total shock and a fantastic honor. I didn’t understand the impact until I went to the awards ceremonies and heard all of the other businesses’ stories. It also felt really gratifying to be recognized like that after all that Milholland has been through in our 25 years in business. SunPower would like to express its gratitude to all the men and women who have served in the U.S. Armed Forces. Thank you for your service on this Veterans Day and every other day of the year. Visit the SunPower Careers page to search for solar jobs in your area.